Celebrating over 100 Years in Business and still a family firm! 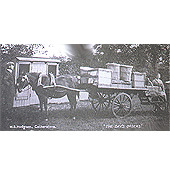 In 1906, two local craftsmen responded to farmer’s demands for small to medium sized poultry houses. They had to be made from seasoned timber to withstand the weather, easily transportable and simple to construct. The craftsmen soon realized there was a great demand for their skills and above all, their product. Soon they had graduated to designing and constructing larger and more impressive buildings. That was how William Hodgson and his son, Alan (my grandfather and father) came to found the company. Their formula for success was simple – give your customer a good quality product at a very competitive price. That formula has been the key to our growth over the years and we see no reason to change it. We remain a family business with the traditions being carried on by my daughter, Denise and my sons Shawn & Stephen. We also have the invaluable support or our ‘adopted family’ – our workforce, all trained in house in every aspect of the business. Some have been with us for over forty years. Traditional skills, values and attention to every detail are blended with up-to-date machinery and construction techniques to enable us to produce durable buildings designed for maximum safety and comfort. With our design team benefiting from another generation of active and practical inspiration, our range continues to expand. Flexibility gives the added advantage of producing a building to suit the customers individual requirements. All our buildings are made from selected timber that is seasoned in our yards and are delivered and constructed by our own skilled professionals. We never use sub-contractors! By following these principals, we have retained the confidence of thousands of customers throughout the United Kingdom and in the process, built a reputation for quality and value that we are proud of.